Editor: Words by Andy Lilienthal; photos by Mercedes Lilienthal. Video by Jesse Hires. 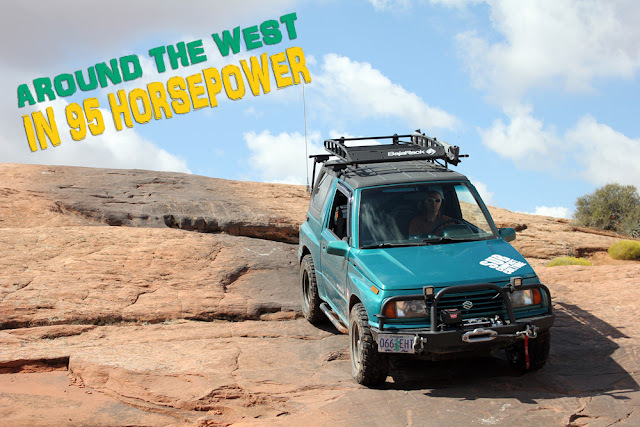 Moab, UT – In part six of Around the West in 95 Horsepower, Mercedes and I had arrived in Moab and explored some of the areas around the iconic Utah town. 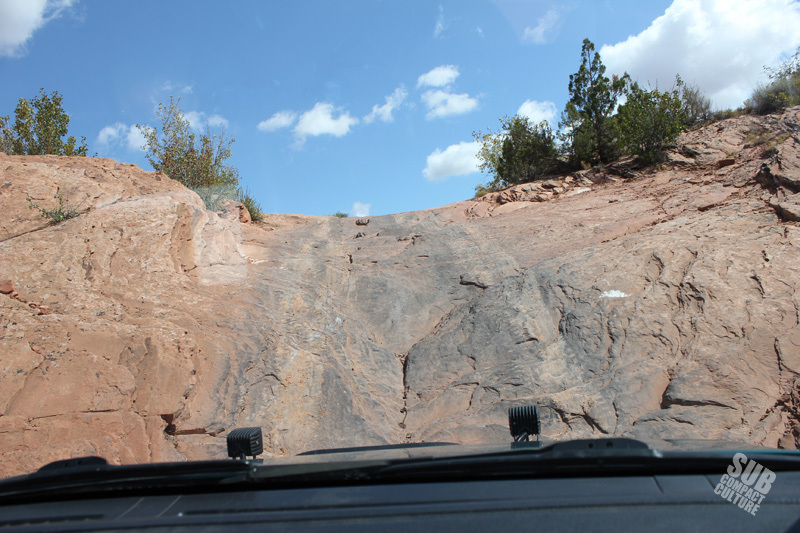 In this segment, we’ll run one of the 4×4 trails. 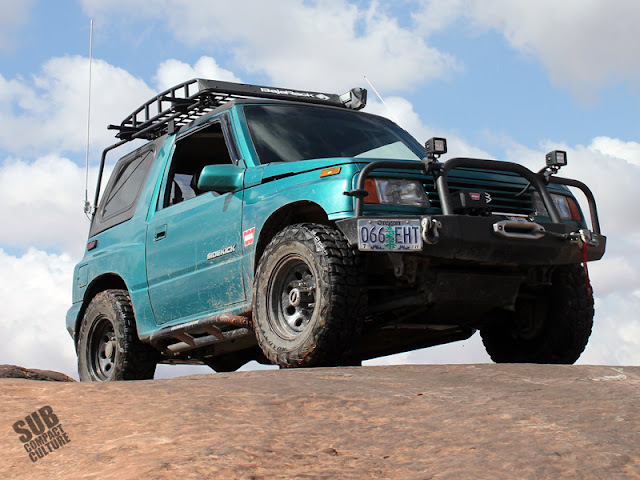 Today we’d run our first trail in Moab in the Sidekick. 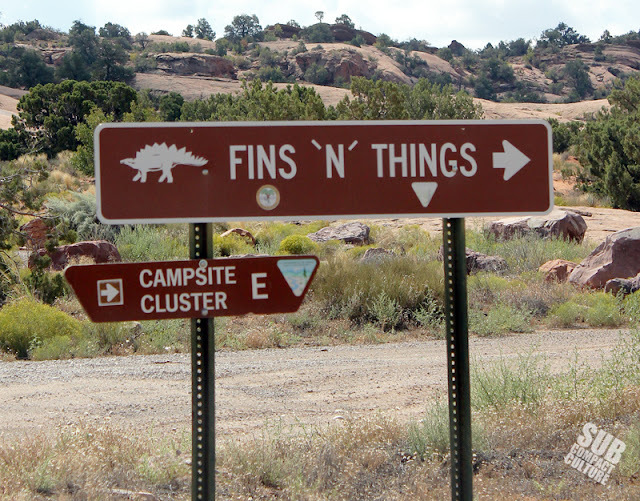 We decided to run Fins N Things, which is rated a 5 out of 10 in terms of difficulty. We figured with our rear locking differential (e.g. “locker”), rock sliders, lift, and tires, we should be set. 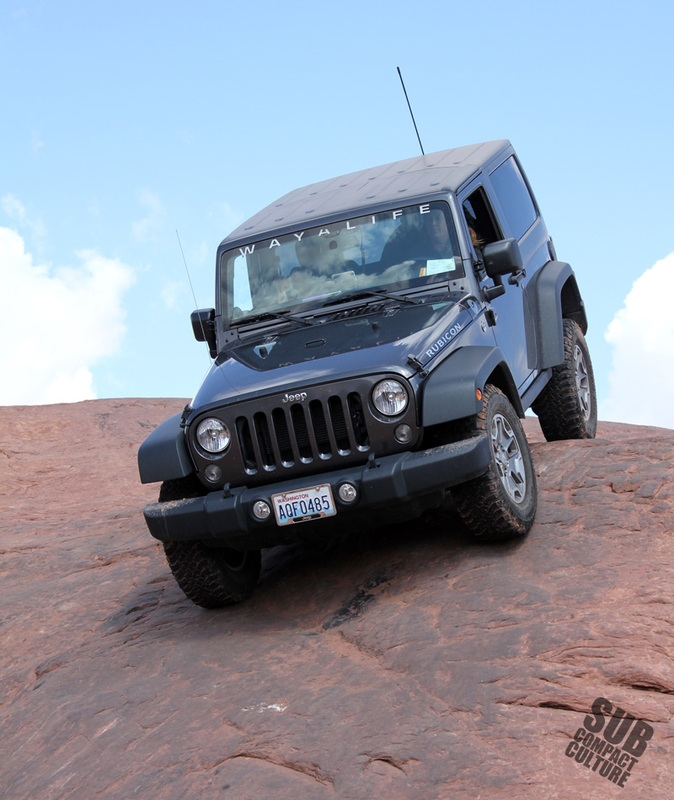 If we did get hung up, we have our Warn winch and a myriad of recovery gear, too. It was a warm, sunny morning. We got to the trailhead and it looked like it’d just be us on the trail. This wasn’t my first time on this trail, but it would be my first time driving it. I had ridden along in a Can Am UTV back in 2012; I didn’t remember it being all that difficult. However, I was also in a super-capable UTV, not a 20 year old 4×4. The second I pulled up to the trailhead it came back to me—this was going to be fun. 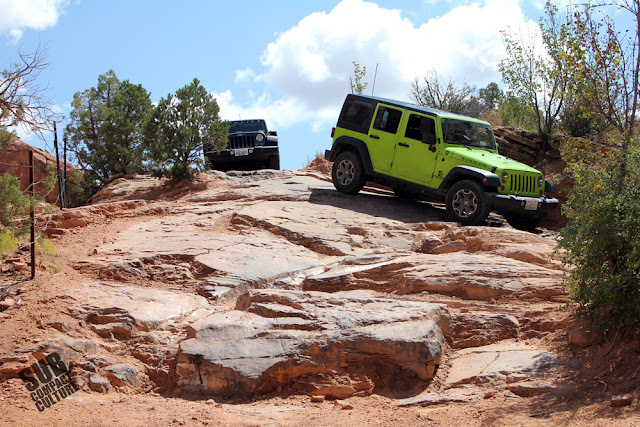 Moab is famous for its sandstone trails, known as slickrock. 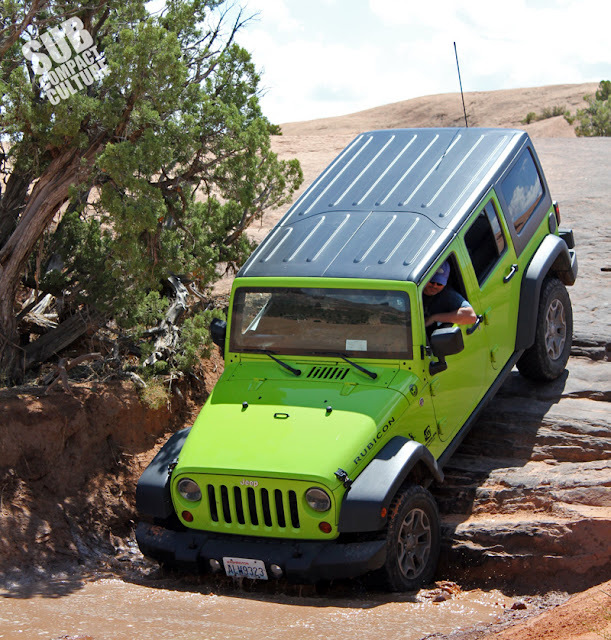 The name is misleading, however, since the slickrock is far from slick; it actually provides incredible traction. It’s like driving on 500 grit sandpaper. You rarely ever have wheelspin—especially in a vehicle with 95 horsepower. 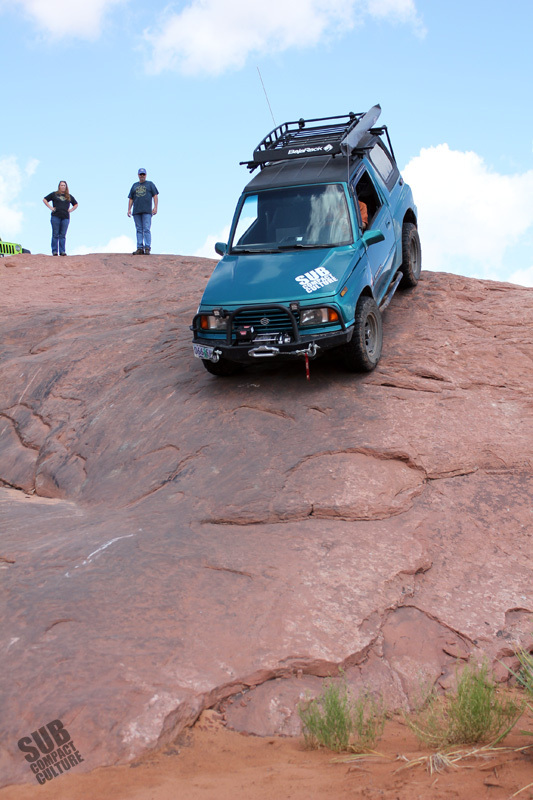 A prime example of the sandstone slickrock found throughout the trails in Moab. Fins N Things doesn’t feature too many crazy off-camber angles or super-steep drops or climbs. That’s not to say it wasn’t going to be a challenge. I knew there were a few moments in which our angles would provide a bit of “pucker factor.” The sun was out, it was getting warm, and it was shaping up to be an awesome day. Jesee, Debbie and their dogs Emma and Amber—also all from the Pacific Northwest! The rest of Fin N Things showcased varied terrain that consisted mostly Moab’s classic slick rock, huge humps and obstacles that were a bit nerve wracking in a vehicle with only 86-inches of wheelbase, and small steps called fins, hence the name of the trail. Conquering a new trail is probably one of the best feelings you can have in an off-road vehicle. It’s a sense of accomplishment that I liken to challenging yourself skiing. Every time you make it down a bigger slope, you learn something new. Same goes for off-road driving. Every time you challenge yourself—and your vehicle—you learn something. It’s extremely gratifying and mildly addicting. Maybe it’s the adrenaline, maybe it’s just the fun of it. 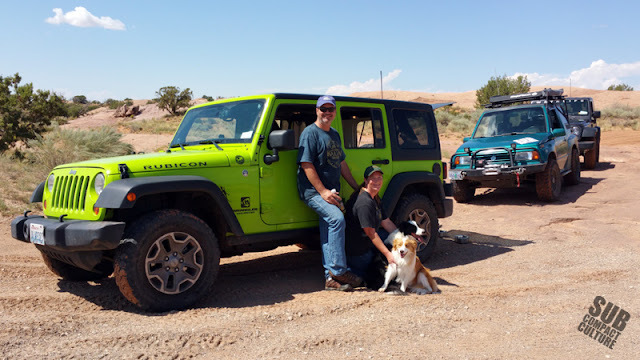 Fins N Things proved to awesome, and it was great to wheel with Jesse and Debbie, the dogs, and their Jeeps. Mercedes and I were both glad we decided to leave our trailer back at camp, however. This wouldn’t have been too good with our trailer and our lack of power. Could we have done it? Probably. But we would’ve needed to be very careful since our trailer was also our house. After our trail ride it was into town for a little window shopping through Moab. FYI, if you find yourself in Moab and are looking for the best coffee, be sure to check out Moab Coffee Roasters. Great java and if you get iced coffee, you can get coffee cubes vs. ice cubes—no watered-down iced coffee. Brilliant! 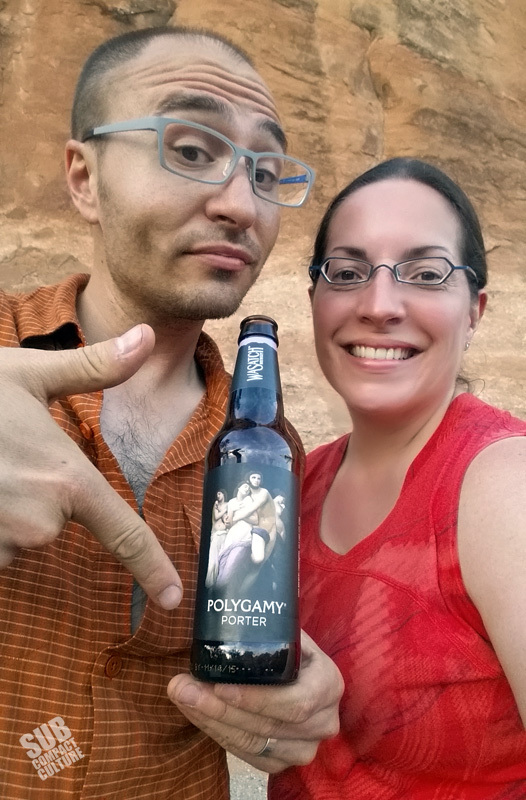 As evening set in, we headed back to the campsite to make a great dinner of pork chops, fresh vegetables, and yes, some Polygamy Porter. 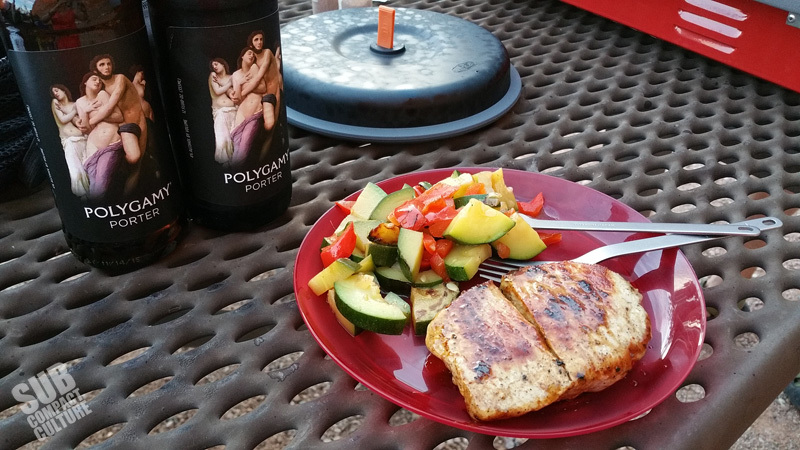 There’s something so satisfying about cooking dinner outside after running the trails. As as the sun began to set, we saw a Ford Bronco II heading towards us. It ended up being a couple of guys who were going to do some recording in one of the sandstone alcoves, which apparently provide amazing acoustics. His truck was absolutely covered in decals. We asked if we could throw a Subcompact Culture decal on his truck and he said sure! 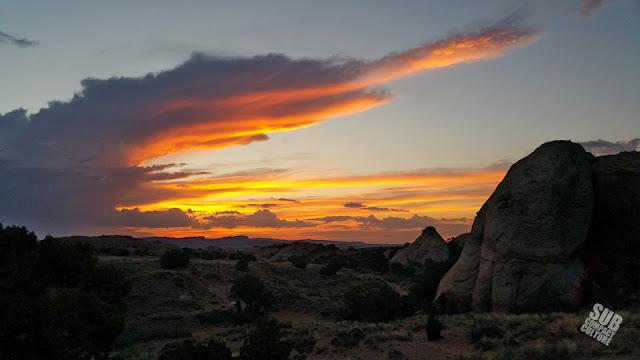 We began what would be our last campfire of the trip, and we witnessed one of the most incredible sunsets I’ve seen. 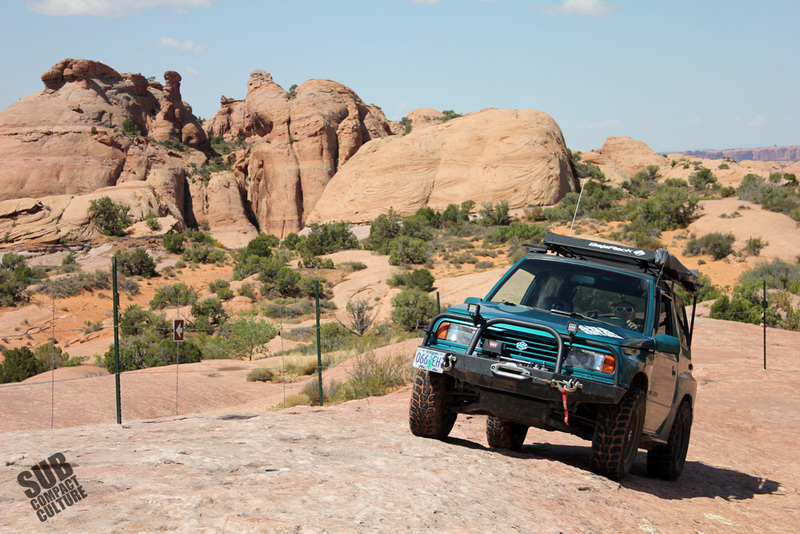 Moab has long held a special place in my heart, and now that I’ve done a bit of wheeling, a bit of camping, and really taken some time to enjoy the place with Mercedes, it’s even more special now. I can’t wait to get back again. 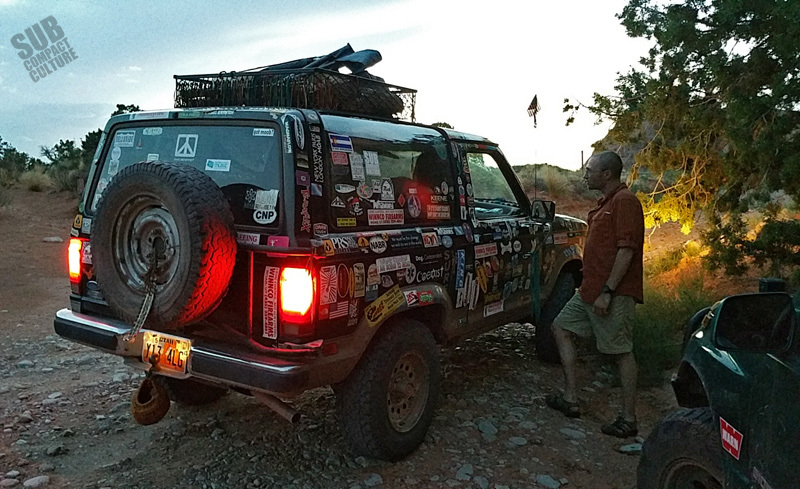 We would head out of Moab the next day, likely bound for northern Nevada. We had no plans, so we just decided to wing it. That ended up proving to be a story within itself. Stay tuned for that soon. Andy, Mercedes, a bottle of porter, and day five without a shower.